Daily Boater Boating News: Will Free Italian Ice Reduce Boating Deaths? Here in the middle of Safe Boating Week, we found one state trying a new approach to keep kids safer while boating. You may remember this from our post earlier this week, or perhaps you’ve seen the statistic elsewhere: 90 percent of the people who drowned in boating accidents last year were not wearing a life jacket. Maryland Natural Resources Police officers are certainly aware of that stat, as they are aware that 2009 was the worst in ten years for boating deaths in their state. That's why it is encouraging to see someone trying something new and different. 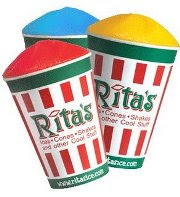 This summer, Maryland is offering kids caught wearing life jackets a coupon for Rita's Italian Ice as part of a stepped up education and enforcement program, according to Candus Thomson in her outdoors girl blog on baltimoresun.com. Will free ice cream alone work? Of course not, but as part of a larger campaign, which it looks like Maryland is rolling out, it could be an effective way to get the attention of families. Furthermore, given the free publicity and ability to get families in the door, I’m sure Rita’s is donating the coupons for free, thus making this an inexpensive effort for the state. And when it comes to saving lives, no effort is too small. We want to hear from you! Do you have any unique (or delicious) programs like this where you boat? What is your state or region doing to improve boating safety this summer? Comment here. I believe that this type of initiative is the correct route. Legislating more laws does not necessarily change people's behavior. Only by educating the populace and getting them to change their own behaviors will we see changes in statistics. My own children wore life vests to the pool and to the beach from day one - that is, as soon as they could walk. This behavior should be the norm, along with learning to swim at a young age. Yacht clubs and neighboring boats, offering to loan small sized life preservers and all of us talking about safety is how we police ourselves. Have you had your 'man overboard' drill lately?